Events are set to kick off at LSBU with an official launch party at 5pm on 7 February to celebrate LGBT History Month, during which, members of the public will be able to explore images on display at our film gallery inside the London Road Building. 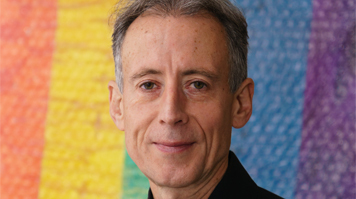 On 15 February, LSBU will host a lively debate featuring high profile guest panellists, including renowned LGBT rights campaigner, Peter Tatchell, Director of the Peter Tatchell Foundation and Emma Scott, Director of Global partnerships for Stonewall, at the Keyworth Centre. The Global Mobility panel discussion – supporting staff and students abroad includes other panellists such as Naomi Roland from International SOS and Owen Francis from Education Practice. The panel will look at LGBT issues likely to affect staff and students when travelling overseas, where human rights observance is not on a par with the UK. This includes preparing staff with a keen awareness of foreign local customs when abroad. LSBU is partnering with international travel security and assistance company, International SOS, to provide medical and security advice and assistance to staff and students, before, during and after periods of work overseas. International SOS supports staff and students from before they leave, until they come home. The organisation does this by helping them prepare for travel, by keeping track of their movements while away, by warning them about emerging risks and providing professional medical and security expertise. Penny Green, Head of Procurement Services at LSBU said:“This debate is critical at this time as this isn’t just an issue for LGBT staff and students, but also for any colleagues travelling with them abroad. It's worth remembering that individuals can be put in a vulnerable position at any time, as they can be ‘outed’ on a trip accidentally.